A New Year, a fresh start, Welcome to BWCSK! You are here: News and Events > Club Notices > A New Year, a fresh start, Welcome to BWCSK! The New Year, 2019 has arrived and with the new year comes a fresh start for the club with a new name and new club badge. We will still be teaching and practicing the traditional Shotokan karate that was taught to us by Shihan Cummins but under the new name of Birmingham & Weoley Castle Shotokan Karate (BWCSK). As many of you may know after the death of Shihan Cyril Cummins 8th dan, his club Birmingham & Halesowen Shotokan Karate Club was reunited with the club that started from it’s lomgest running dojo Weoley Castle Shotokan Karate Club under its new Chief Instructor Sensei Susan Hession. Since then the clubs have run together under a combined badge that maintained elements from both club badges but maintaining both club names. The club has continued to operate as a single club in all practical terms with BHSKC & WCSKC students continuing to train and grade with each other as indeed they did when Shihan Cummins was alive due to the close links that have always existed between them. However during that time things have changed. The long standing BHSKC Bartley Green and Halesowen dojos were closed. The latter continued until very recently under another former student of Shihan Cummins Sensei Matt Russell at Birmingham Karate (formally Quinton SKC). New students have joined who never knew the clubs prior to the merger and the details behind the dual identity. Last but not least the current names no longer truly reflect the clubs geography. 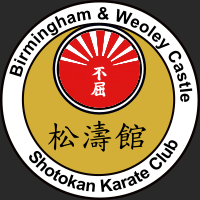 As we move into 2019 we are rebranding the club as Birmingham & Weoley Castle Shotokan Karate (abbrieviated to BWCSK), hopefully a bit easier on the tongue and as we no longer have a Halesowen presence more reflective of the clubs geography. With the new name comes a new badge and an updated website.Don’t worry all the old posts you know and love from the old sites still remain on our legacy BHSKC and WCSKC web sites, Going forward the new site will continue under the biminghamshotokan.com address and will be updated with the latest news and information from the club.